An exquisite Tri-plated medallion featuring two hands clasped in prayer. 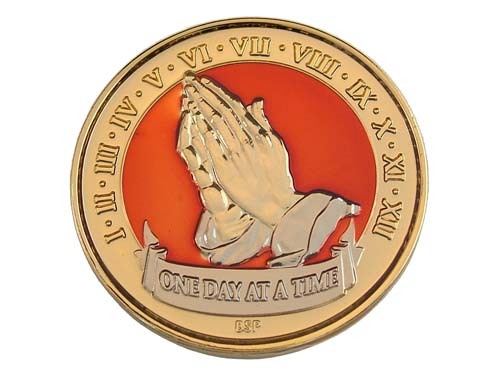 The silver colored scroll at the bottom reads "One Day At A Time" and Roman numerals 1 - 12 grace the top of the coin - one for each of our steps. Available in three elegant colors: Midnight Blue, Mandarin Red, and Classic Black. These are truly beautiful medallions! 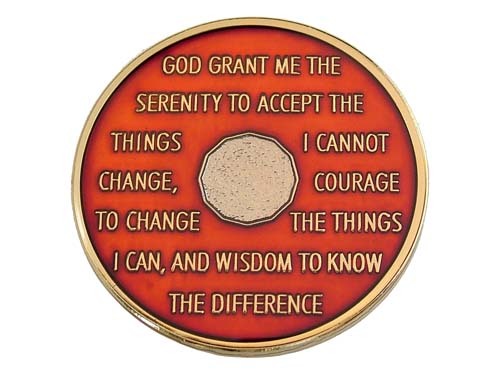 Each tri-plated medallion is expertly crafted and adorned with the Serenity Prayer on the reverse side, too! A magnificent commemorative chip for miraculous achievements! At WoodenUrecover.com, all Tri-Plated Medallions are delivered in a nice velvet gift pouch at no additional cost! However, please consider purchasing one of our Coin Capsules to further protect this beautiful keepsake.